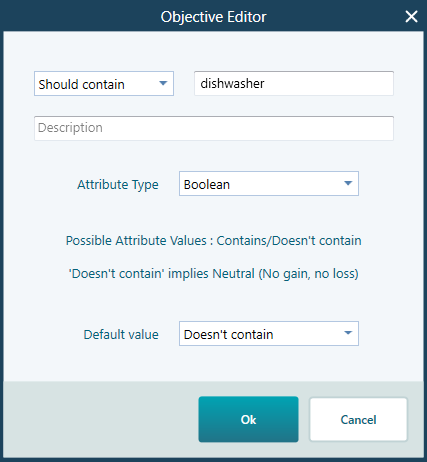 What is a Boolean objective? Many times, you have an attribute of your criterion that can be answered by "Yes/No", or "True/False", or "Has/Does not have", or "Contains/Does not contain" etc. For example, say you are shopping for a car and your objective is that "The car must have a built-in GPS navigation system". So, when you find a car to buy, you as a question "Does it have a GPS navigation system?". The answer can be "yes or no". These kinds of attributes are called Boolean type attributes. And, when you have such a criterion, we can say it is a Boolean type objective. 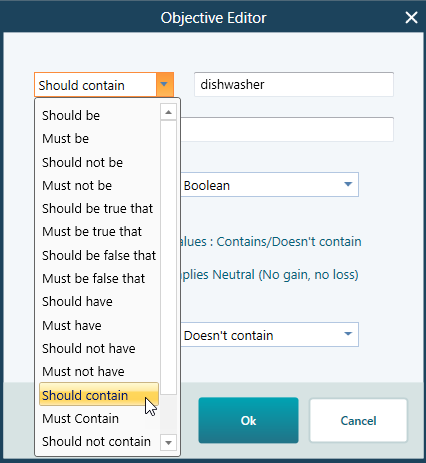 After you have created a boolean type objective, when you will set a payoff for a decision tree node, you will be presented with a rounded check button for "Yes/No", or "True/False", "Has/Does not have" or "Contains/Does not contain" as shown in the following screesnhot. Please note that you will see such view when you have more than one objective. 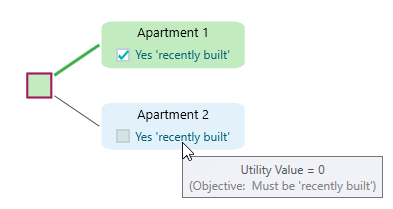 But if you have only one objective and if that objective is a boolean type, then you will see a checkbox directly on the decision tree node as shown below. Then you can click the "Proceed" button. Once you click the "Proceed" button. We have already explained how to invoke the objective editor. Once you create a boolean type objective and open the objective editor for the boolean type, you will see the following view. You can change the conditional from the drop-down box as shown below. 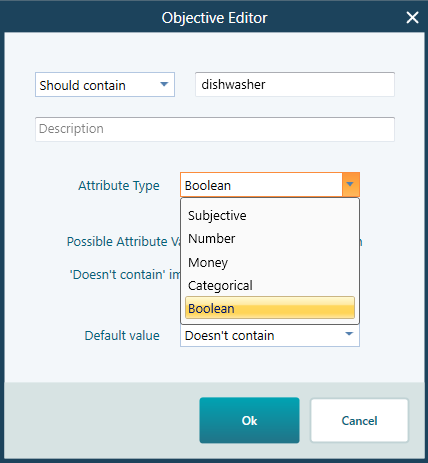 The default value is the value that is checked by default in the Payoff window when the objective criterion is a boolean type. You can change the default value for a boolean type from this drop-down box. You can change the criterion type from Boolean to something else from this drop down. The utility value for a boolean type is inferred as 0 or 100 (or 1 based on your preference). Based on the conditionals you chose, the software will infer your intention and assign a utility value for you. 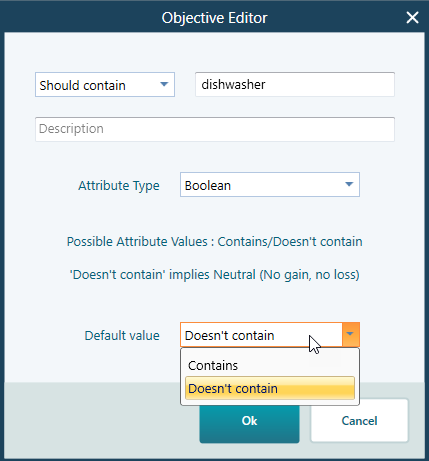 For example, if you set the objective as "Must contain a dishwasher" then in the payoff window if you specify that the apartment does not have a dishwasher, the software will infer utility value as 0. Because, the software will assume that, you will not consider an option if it does not have a dishwasher. 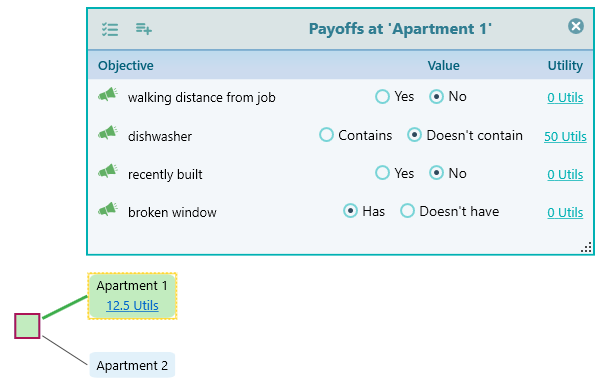 But, if you model the conditional as "Should contain a dishwasher", then in the payoff window, if you specify the apartment does not have a dishwasher, the software will infer the utility value as 50. (midpoint from 0 t 100). Either case, if you specify that the apartment has a dishwasher, then the software will infer the utility value as 100. Same is true for other conditionals, like "Must be", "Must not be", "should be" etc.